Sierra Nevada Airstreams -> TT Owner's Guide -> Living - Enjoyment of the whispering winds, the zephyrs, the airstreams of the Sierra Nevada and Great Basin areas of the United States. One of the first things cold weather campers find out is that the furnace in their RV will run the battery flat in short order. That usually starts the search for how to keep warm and not run the battery down. The catalytic heater is the usual choice to do this. Catalytic heaters are space heaters that provide a hot radiant surface to warm up whatever is in front of them. They do not have a fan (that uses battery juice) to blow hot air around the inside of the rig. Always provide ventilation by cracking a window or vent when the heater is in use. Never use a catalytic heater when sleeping or when unattended. Be aware of the symptoms of low oxygen and carbon monoxide poising and take action if you or someone else in the heated area even thinks they might or appears they might have them. Action is getting outdoors immediately and venting thoroughly. You do have to vent "any" type of carbon based fuel heating appliance including a catalytic heater. You can never get rid of by-products of combustion of carbon based fuels without venting. PERIOD! Granted, there is less combustion by-products with a catalytic heater but they do have to be vented. Not to vent any carbon based fuel system will cause death under the correct conditions and using them in a RV is just about the most correct conditions you can have for death to occur. A e-mail, letter or call too the AGA, The American Gas Assc. will prove this to you. The second consideration is there a fire hazard if not installed correct or not operated with proper clearance to combustible items, like curtains, rugs, pets, coats, paper, shoes, etc, is not maintained. That could be a piece of paper being blown off the table from the "open" vent and landing on the catalytic heater face while your sleeping. Are they as safe as your forced air furnace? Absolutely not! Why? Your furnace has a "vented" "enclosed" combustion chamber. A solar PV, about $320 cost, would be a better solution to keep your battery charged while using your RV furnace. I spent the past 35yrs designing and installing HVAC systems, and the past 50yrs plus camping. I sure would hate to see someone get hurt trying to save a few bucks. Nearly all means to warm up the inside of an RV depend upon converting propane and air into heat and water and obnoxious and dangerous gases. For space heating, the key factors are how big a volume needs to be heated, how well is this volume contained, and how much of a temperature difference is desired between inside and outside. Catalytic heaters typically produce less than a third the heat of a furnace. 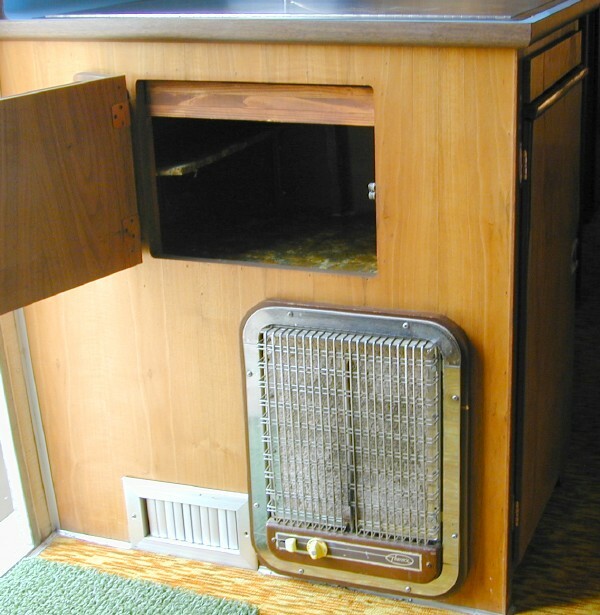 This means that they are designed for heating a smaller area and not for distributing heat throughout the RV. But consider that a catalytic heater has a 100% duty cycle and the furnace duty cycle is less than 50% except for extremely cold weather. DukTec http://www.ducktec.com/ - stove, heater, and furnace catalog. note: all photographs on this site are for personal, private, and non-commercial use only. All other copyrights are retained by the individual photographers. See our policy. Disclaimer: any advice or suggestion presented is provided for informational purposes only and is correct and accurate only to the best of our knowledge at the time it was written. Anyone using such information does so at their own risk. Errors or omissions may exist and additional sources of information or appropriately licensed or qualified personnel should be consulted in deciding a course of action. We assume no liability or obligation by providing this information and warn any users of this information that they do so at their own risk. All links or references to commercial vendors or other sources of information and equipment do not intend or imply or convey any endorsement of that source or the product. They are provided strictly for informational purposes to illustrate the topic at hand. Sierra Nevada Airstreams Enjoyment of the whispering winds, the zephyrs, the airstreams of the Sierra Nevada and Great Basin areas of the United States is a personal, nonprofit, noncommercial web site intended for educational and recreational use only. This site is supported by volunteer effort and contributions.